The morning dawned bright and sunny on Wednesday and, although it clouded over later, it remained fine. We had another slow start. I had several other points on the pilgrimage yet to make, and so Cathy decided it would be good for me to take the children out while she did the bulk of the packing up. Before leaving Tanunda, we visited the bakery and bought some bienenstich (bee-sting) cake and a apfel-streusel küchen for morning tea. 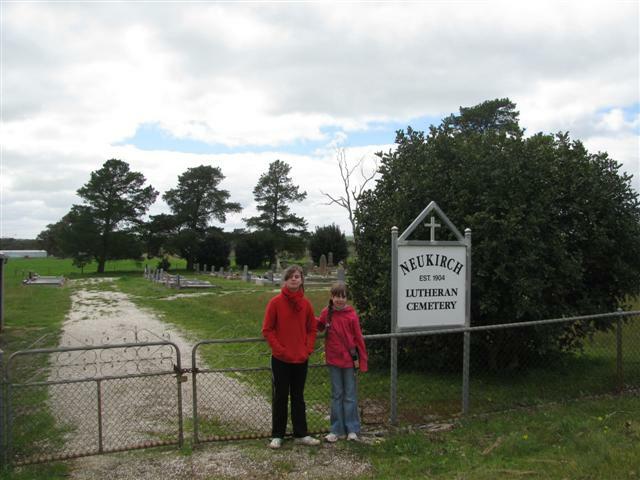 First stop on the list was the Neukirch Cemetery. This cemetery is not attached to the church building, but is about another 300 metres down the road from the Neukirch Church (is that a tautology?) out in a paddock all on its own, a kilometre or so north west of the Ebenezer Lutheran Church, north of Nuriootpa and west of Stockwell. This is where my mother’s father’s grandparents (my great, great grandparents, and the children’s great, great, great grandparents) are buried. They had the wonderful names of Johann Heinrich Theodor Heintze and Johanna Maria Magdelena (nee Schultz). We located their grave easily enough, and picked some wild flowers to place on their grave, before a moment of prayer thanking God for their lives and praying for their eternal rest. 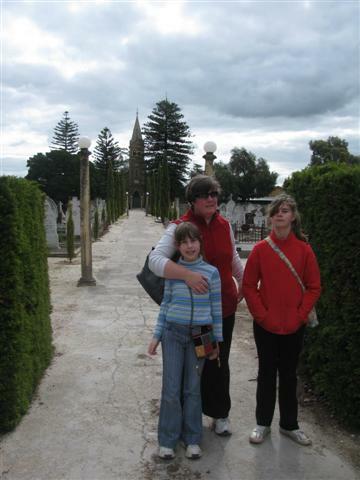 The girls at the entrance to the Neukirch Cemetery where their Great, Great, Great Grandparents Heintze are buried. Next stop was a little further to the south and west at Nain, a church just down the road west of Greenock. Here the parents of both Johann Heinrich Theodor and Johanna Maria Magdelena are buried: great, great, great (+ an extra great for the kids), grandparents Schultz (yes, with an ‘L’ – different family from the Schütz’s) and Heinze (yes, without the ‘t’ – that was added by their children). These were the original immigrants to South Australia on the fourth ship in Pastor Kavel’s floatilla, the Skjold, which arrived in October 1842. They had originally settled in Bethany in 1842, before moving up north to this area. 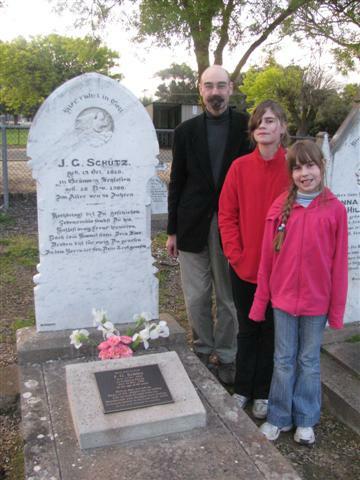 The Schultz’s still had their original gravestone, indicating that the old man’s 200th birthday had been in August this year (so he and my Great, Great, Great Grandfather Schütz were both born in 1810). The Heinze tombstone however looked newer, probably 1950’s, although it indicated that Old Man Heinze had been born in 1795. It seems amazing that I can trace my family history back to the 18th Century. Again we said prayers at both gravesides, and placed some wild white irises which we had found growing on the side of the road on their graves. We headed back into town, and had lunch of bread, cheese, tomato, fritz and metwurst (washed down with a glass of Bethany white wine) before leaving Little Para Cottage. 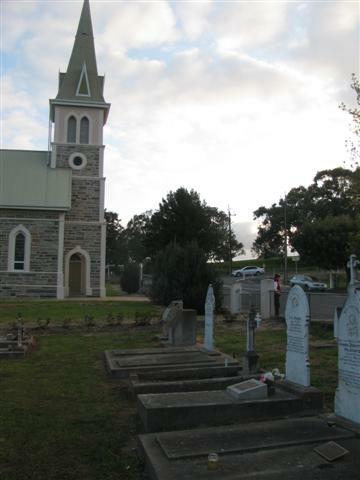 We stopped in Tanunda and visited Langmeil Church and Cemetery, where Pastor Kavel is buried. The church was open during office hours – but not when we were there – office hours finished at 12 noon. So we were not able to enter a single church during our ‘pilgrimage’! This church is, however, not only one of the most significant historically in the Valley, but also one of the most beautiful, with the cemetery at the front, lining both sides of a central path leading up to the church door. Very well planned for maximum picturesqueness! 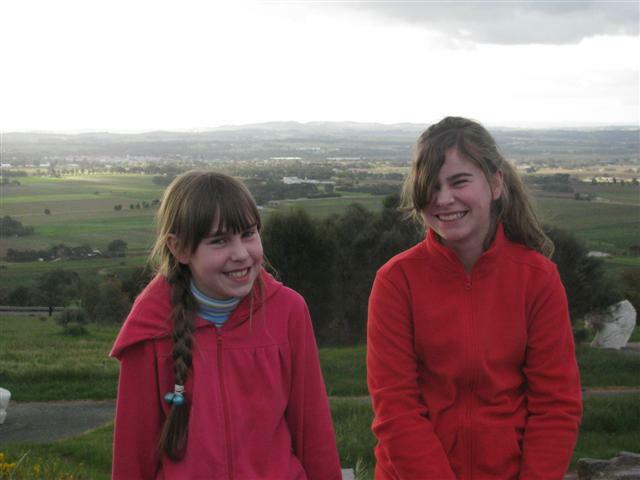 Our next plan was to visit one more winery before finding a lookout from which to see the whole valley. 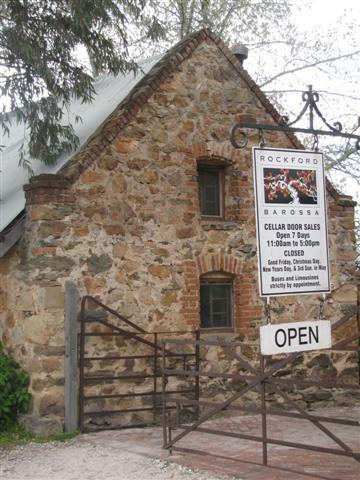 We went to Rockfords, south of Bethany, which has always been a favourite. They do a beautiful “rose-style” wine called Alicante Bouchet, and a very nice aged tawny port. Heading back through Bethany, we decided to follow the unpaved track up Kaiser Stuhl, the high hill at the bottom of the valley, up which (according to a popular story which, to my annoyance, the expert historian Pastor Henry Proeve declared “spurious” in the book “The Barossa Valley: A Vision Realised”) Pastor Kavel was said to have marched his congregation to await the return of the Lord and the start of the Millenium. 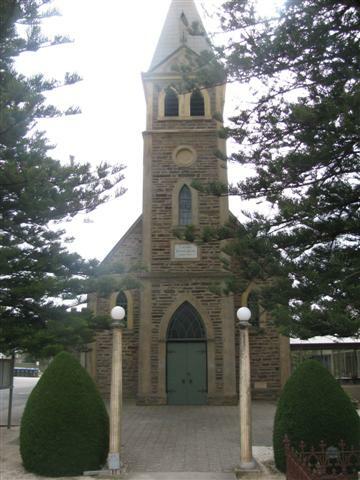 The dispute over millennialism and the proper interpretation of Revelation 20 was at the centre of the famous split at the synod of Bethany in 1842 which resulted in Pastor Kavel and Pastor Fritsche leading their flocks in separate directions, and eventually to the “Two Churches”, the Evangelical Lutheran Church of Australia (ELCA – Pastor Kavel) and the United Evangelical Lutheran Church in Australia (UELCA – Pastor Fritsche). This split, in which my family ended up with the UELCA, was only healed with the formation of the united Lutheran Church of Australia in the year of my birth, 1966. It could be said that I was the first person to have been both baptised and ordained in the LCA, although strictly speaking, I was baptised a month or two before the union was officially declared and celebrated. Anyway, we went up the hill, which afforded the most magnificent views of the valley, much better than the better known view from Mengler’s Hill slightly to the north. However the latter has a paved road and viewing area at the top, which means it is much more accessible. 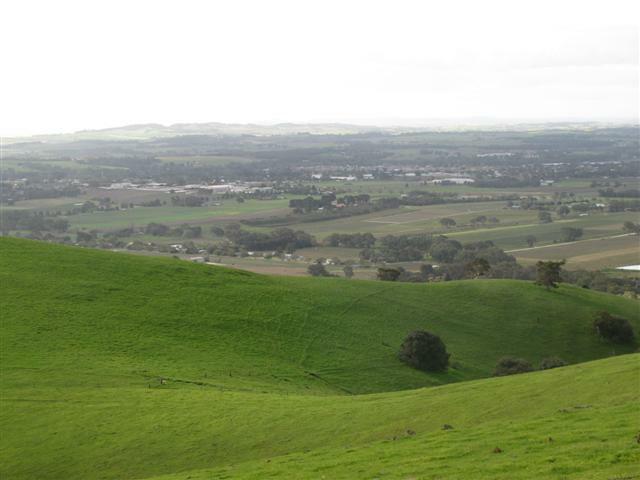 From here you can see why the Barossa Valley IS a true valley, as you can see the circle of hills all around the flat in which Tanunda and Nuriootpa are central. 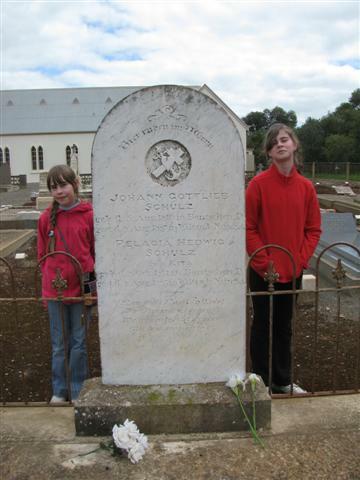 We went next to Mengler’s Hill, where there is a memorial to the German Settlers and to their faith, before leaving the Valley and heading over the hills to Flaxman’s Valley, where Great, Great, Great Grandpa Schütz settled and lived out his life to 1900. 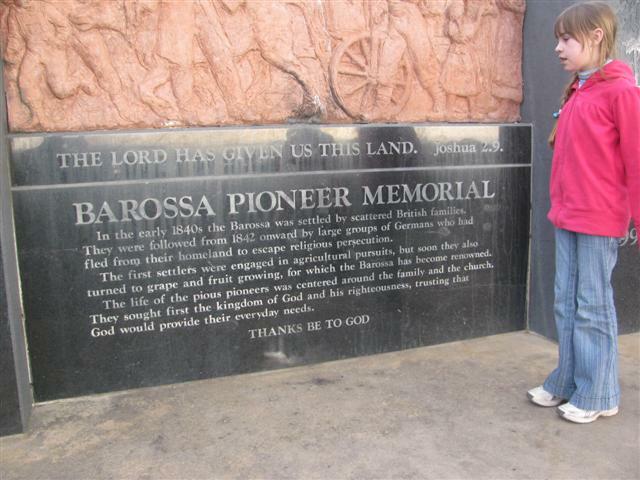 The Memorial to the Barossa Pioneers on Mengler's Hill. Note the text and its thankfulness to God. We were able to locate the farmhouse where Great, Great, Great Grandpa Johann Gottfried built his home and from which his sons set out to make a new life for themselves much further north at Point Pass. The owner of the farm was in the yard, and he confirmed that this was indeed the original Schütz holding. He was happy for us to take pictures of the farm, but didn’t invite us in, so we turned around and headed for Eden Valley, home of the best Barossa Reislings (although not strictly Barossa) and where my ancestor is buried with his wife in the cemetery of St Petri Church. Again we laid fresh wild irises on his grave and sang “Happy Birthday dear Johann Gottlieb” for his 200th Birthday coming up. 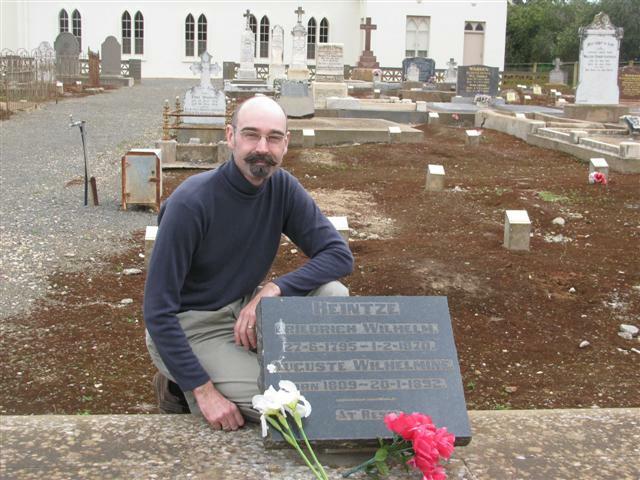 Matthias asked what was on the bronze plaque set in front of his tombstone, and it is a literal translation of the German poem on his tombstone. Heavenwards your thoughts were tending. In life ever trusted to console. From there we headed down to Springton, where there is the famous “Herbig Tree”. 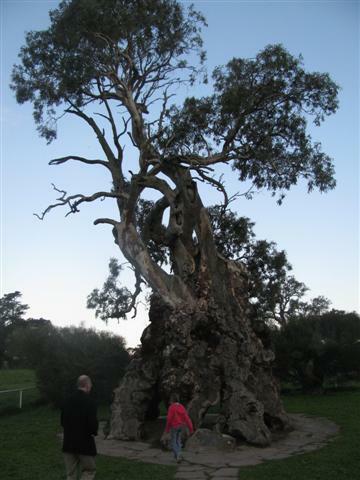 The Herbigs, a family of 16 surviving children, converted this ancient hollow gumtree into their home for five years between 1855 and 1860. Old Vater Herbig had been the tailor in the same town that my ancestor came from, Grünberg in Silesia, and they had come out in 1855 on the same boat as he did, the Wilhemine. Yes, we all have boat people and refugees in our ancestory! That was the end of our ‘pilgrimage’ properly speaking, as we headed back into Adelaide through Williamstown and Gawler. 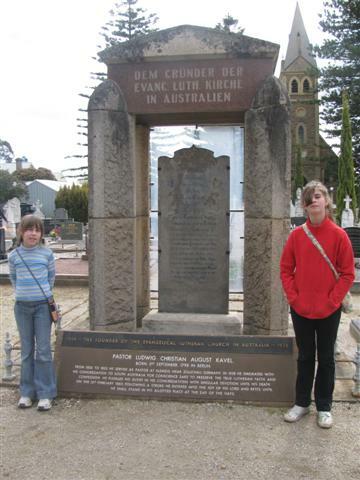 It has been a remarkable trip, and we hope to top it off tomorrow with a brief visit to Hahndorf, where my grandfather’s grandfather’s grandfather on my father’s side brought his family in his old age and where he died in 1839. Unfortunately we have no idea where he was buried, so no more graveside visits, although I do know where he lived, as records show the land that he purchased. [Post Script: We spent the next two nights in Adelaide with a friend of Cathy’s. I took the children to the Adventure Playground at St Kilda (nb. St Kilda in Adelaide has only one similarity with St Kilda in Melbourne – it is near the water). 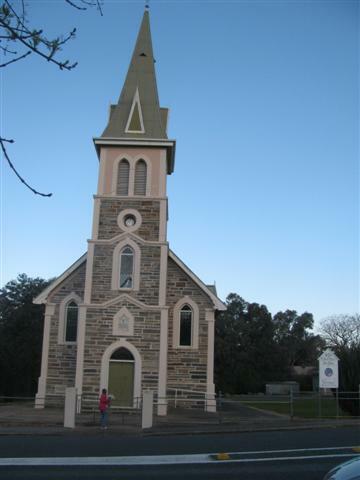 On Friday we drove to Pinnaroo (my home town) via Hahndorf. We saw the property which was originally owned by my Great Great Great GREAT Grandfather Pfeiffer, who came out on Captain Hahn’s ship, The Zebra, in 1839, with his wife, son and young grandchildren. Unfortunately he and his wife both died in the cold winter of 1839 when the vegetable crop failed – basically of malnourishment and pneumonia. We don’t know where they are buried. His son – my Great, Great, Great Grandpa Pfeiffer – is, in fact, buried in the Immanuel Lutheran Cemetery in Point Pass – something I didn’t know when we were actually there visiting the other Great, Greats. Damn. Next time. For all sorts of reasons I have loved this travelogue. German Lutheran history in Australia has always fascinated me and I have been priviledged to have had many fine Lutheran friends. The Lutheran contribution to life in South Australia has been much more significant than their relayively small numbers mint otherwise suggest. 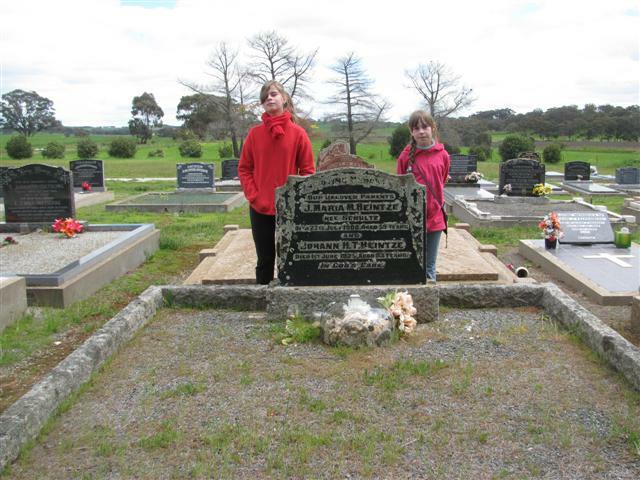 Many, many thanks David for allowing us a share in your family history and family pilgrimage. My very great pleasure, Fr J.! I have enjoyed your journey as well, David, I’ve learned so much fascinating history of the German Lutheran presence in Australia going way back before my family’s sojourn. Oh, and as for the bienenstich and apfel-streusel küchen — two of my favorite German baked treats! The process of writing about a journey (not to mention having a journey ‘theme’) turns ‘travel’ into a ‘pilgrimage’ and makes it that much more worthwhile IMO. 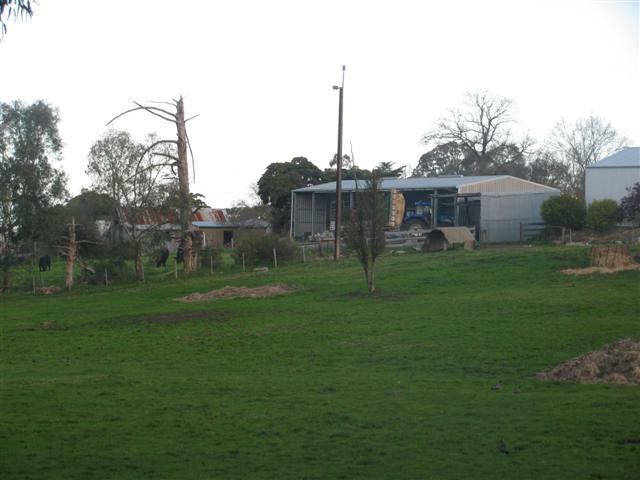 The friends we stay with from time to time own the old Herbig dairy farm within cooee of the Herbig Tree. On a journey back from Melbourne via Echuca a few years back we passed through Ouyen (on the way to Pinnaroo). The Ouynen bakery’s claim to fame is to have ‘Australia’s best vanilla square’. It was good too! 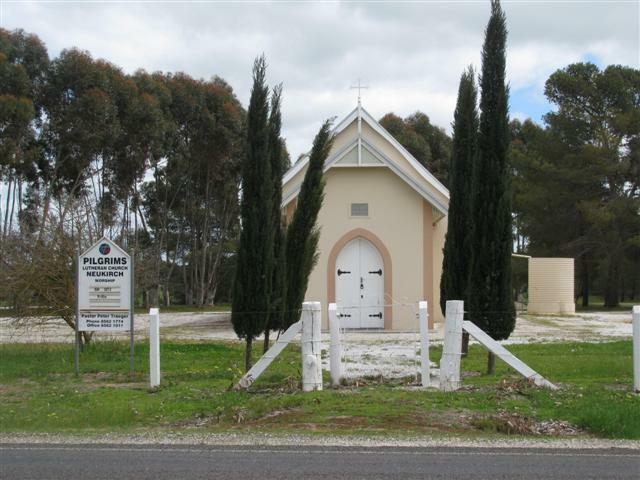 Speaking of pilgrimage, if you’re heading west towards SA these days it really is worth a more southerly journey and going via Penola and checking out ‘Mary MacKillop country’. The ‘Terra Rosa’ of the Coonawarra and uniqueness of the Coorong are added benefits! 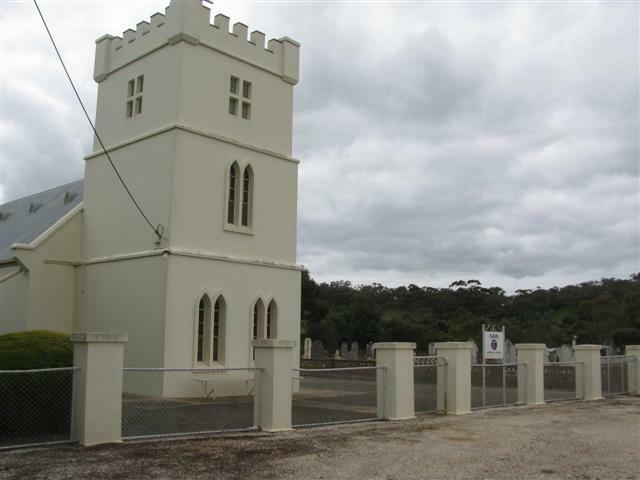 We are going to Mt Gambier for our Schutz family Christmas celebrations, and it is my intention to take a detour on the way back via Penola (and Coonawarra…) to make that a kind of pilgrimage as well. I have already floated the idea with the family. Yes, David, to share vicariously in your journey back to your fatherland in “New Silesia” has been a privilege.